While the Panathinaikos Athletic Club started in 1908, it wasn’t until 1922 that the basketball team started up, making them one of the oldest basketball teams in Greece. While the team has achieved great success in domestic and European basketball, one of the club’s proudest achievements is the fact that they have never been relegated. This means that Panathinaikos have taken part in every First Division Championship in Greece, an accolade that they share with Aris B.C. Panathinaikos have won the Greek Basket League Championship on 34 occasions and the Greek Cup 16 times. This has enabled the team to celebrate 9 Doubles and these three achievements are all records in Greece. Domestic success is vital for clubs but the fact that Panathinaikos have won the Euroleague on 6 occasions and the Intercontinental Cup once makes them a team that is known and respected throughout Europe. The combination of domestic and European success has enabled Panathinaikos to have won the Triple Crown on two occasions. While the history of the club refers to the period between 1970 and 1984 as The Golden Age of Panathinaikos, the new millennium has been a successful time for the team. The club won the Greek Championship 9 seasons in a row, between 2003 and 2011 and they also won the Greek Basketball Cup five seasons in a row, between 2004 and 2009, another record. The fact that Panathinaikos hold so many records in Greek basketball is a source of great pleasure and pride to their fans, particularly when you consider the bitter rivalry they have with Olympiacos Piraeus. When you have a rivalry that is referred to as the “derby of the eternal enemies”, you know that this is a serious encounter and only the rivalry between Barcelona and Real Madrid can match the intensity for non-NBA basketball rivalries, making this a match-up that is watched all over the world when it takes place. The first time that Panathinaikos clinched the Greek title was in the 1945/46 season and this triumph was repeated the following season. The team started the 50s in great fashion winning the league in 1949/50 and in 1950/51 but only one more triumph was to follow in this decade, in the 1953/54 season. The 60s were a more successful decade for Panathinaikos, with league triumphs in 1960/61, 1961/62, 1966/67 and in 1968/69. However, as the club states themselves in their history, the 1970s were the beginning of a Golden era for Panathinaikos. A run of consecutive titles from the 1970/71 season through to the 1974/75 season was backed up by a win in 1976/77 and then the team embarked on another successful run which spanned 1979/80, 1980/81 and the 1981/82 season. The team was again triumphant in the 1983/84 season but it would be close to 15 years until Panathinaikos tasted success again. However, since 1997/98, Panathinaikos have been the dominant team in the Greek Championship and it would be easier to tell you the seasons that the Athens team didn’t win the league. 2001/02, 2011/12 and the 2014/15 season were the three non-title winning years since 1997 for the leading Greek basketball team. The 16 Greek Cup wins is also a record for Greece. The team first won the Greek Cup in 1978/79 and followed this with three triumphs in the 80s, 1981/92, 1982/83 and 1985/85. There were only two triumphs in the 1990s, in 1992/93 and in 1995/96 but much like the Greek Championship, Panathinaikos have been the dominant team this millennium. This has been shown by Greek Cup triumphs in 2002/03, 2004/05, 2005/06, 2006/07, 2007/08, 2008/09, 2011/12, 2012/13 and 2014/15. The wins in 2011/12 and 2014/15 means that Panathinaikos have clinched at least one of the leading Greek tournaments every season since 2001/02. Panathinaikos achieved their first Double in the 1981/82 season but since the turn of the millennium, they have clinched the double 8 times. The historic seasons were 2002/03, 2004/05, 2005/06, 2006/07, 2007/08, 2008/09, 2012/13 and 2013/14. The five consecutive double years between 2004/05 and 2008/09 highlights how dominant Panathinaikos have been in the modern era of Greek basketball. However, you shouldn’t just think that Panathinaikos have been dominant in domestic basketball; they have clinched a total of 6 Euroleague titles, the most that any team has claimed in the modern Final Four era of the Euroleague, which began in 1988. The first Euroleague triumph for Panathinaikos was also the closest, taking the title by just one point in a much remembered and fondly adored triumph against Barcelona. The fact that this was the first Euroleague win for Panathinaikos meant that it was always going to be a special occasion but the nature of the game means that many fans look back on this as being the sweetest of all 6 wins. However, the two titanic battles against CSKA Moscow in 2006/07 and 2008/09 are also fondly remembered by Panathinaikos fans and Greek basketball lovers. Panathinaikos also lost out in the 2000/01 Euroleague Final and have made it through to the Final Four on 11 occasions since 1993/94. The 2006/07 and 2008/09 seasons were notable for being the seasons where Panathinaikos managed the Triple Crown, clinching the Greek League, the Greek Cup and the Euroleague. Given that Panathinaikos also won the 1996 Intercontinental Cup, a 243-267 three-legged triumph over Olimpia from Argentina, they can rightly claim to be the leading basketball team from Greece. The fact that their Intercontinental triumph came against a team with a name that sounds similar to their closest domestic rivals, there was further reason to celebrate this triumph! Panathinaikos play their home games at the Athens Olympic Indoor Hall, which is the biggest indoor venue in Greece and the venue forms part of the Athens Olympic Sports Complex. The venue was initially finished in 1995 but benefitted from renovations which took place to upgrade the arena for the 2004 Summer Olympics held in Greece. The Athens Olympic Indoor Hall is regarded as one of the best indoor sports venues in Europe and while the current seating capacity is 19,250 it can breach the 20,000 mark for certain games and events due to standing room. For many years, the venue held the highest attendance record for a Euroleague game, 20,000 fans for the game against Benetton Treviso in March of 2006. 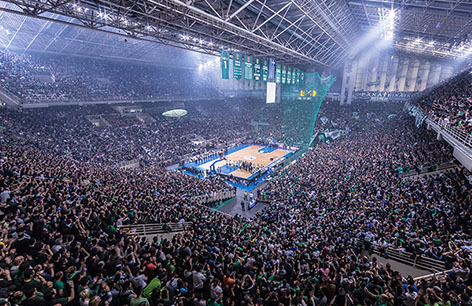 The venue has also welcomed a crowd of 18,900 fans on three occasions, making this a venue with some of the best attendance records in the whole of European basketball. Panathinaikos have faced off against NBA opponents on three occasions and hold a 0-3 record. In 2003, they lost 100-76 to the Toronto Raptors in Canada and in 2006, they played two games, losing 107-70 to the Houston Rockets and 113-91 to the San Antonio Spurs. Both of the 2006 games were played in Texas. Panathinaikos have fared better against Chinese opponents, holding a 3-0 record. In 2013, the score was Foshan Dralions 66 – Panathinaikos 67 in a game played in Guangdong. In 2015, Panathinaikos won two games against Chinese opposition. The first game finished Zhejiang Lions 64–83 Panathinaikos while the second game finished Guangdong Tigers 63–85 Panathinaikos. Some of the most notable players in Panathinaikos history include Fedon Mattheou who played for the team between 1949 and 1955 and Giorgios Kolokithas who played between 1966 and 1973. In more modern times, players Dejan Bodiroga, who played between 1998 and 2002, Željko Rebrača who played between 1999 and 2001 and Darryl Middleton, who featured between 2000 and 2005 have had a big impact on the success that Panathinaikos have achieved. Of the current Panathinaikos squad, in the 2015/16 season, players like Dimitris Diamantidis, James Gist, Miroslav Raduljica, James Feldeine and Nick Calathes are integral to the way that Panathinaikos play. Latest News about Panathinaikos B.C.